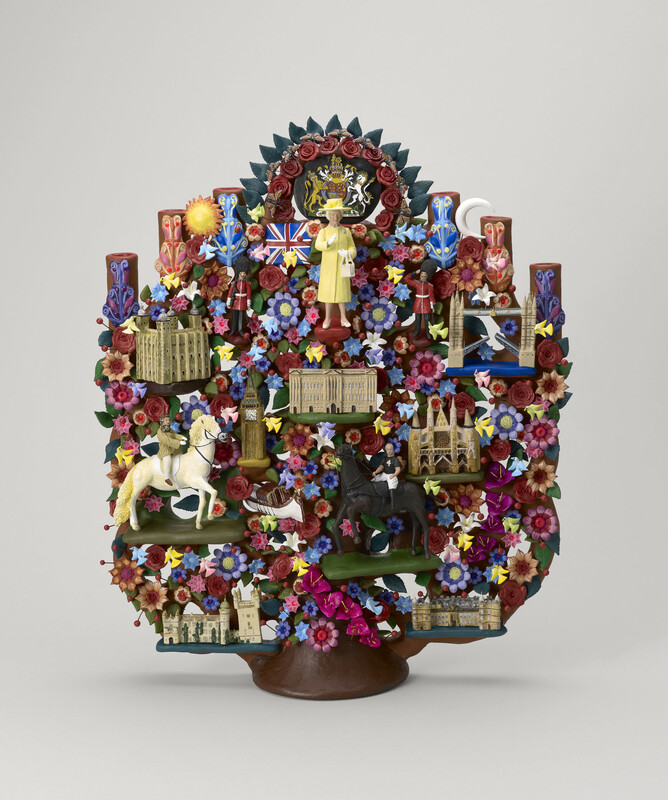 A Tree of Life of HM Queen Elizabeth II modelled from clay and decorated with colourful symbols representing British culture and the interests of Her Majesty. In a red leather presentation box with a gold embossed symbol of Mexico and 'MEXICO / PRESIDENTIA DE LA REPUBLIC'. Trees of Life are an artistic form known for many centuries in pre-Columbian Mesoamerica. The intricate structures are made from pottery, with a central trunk and elaborate sprouting branches producing a candelabra-like form. Traditionally these sculptures depicted key figures and symbols of indigenous Mayan, Mixtec and Aztec religion, but after the arrival of European Catholics they were adapted to represent the Biblical story of the Garden of Eden. In this form they were used as incense burners and teaching aids. Today the Tree of Life remains prominent in Mexican popular art and is reproduced in an ever-expanding range of media and styles. This example includes The Queen standing centre top in a yellow ensemble, with her official residences, uniformed Guardsmen and Westminster Abbey featured throughout the tree. Further down the tree, The Queen is depicted riding a grey horse, and The Duke of Edinburgh riding a black horse.